Discover the foods that are making you sick and tired—and feel better fast! Empower yourself with knowledge and healing recipes. Get instant access to our 4 FREE Elimination Diet Cooking Videos now. Find the Diet that is right for you. An Elimination Diet is a powerful tool to get to the root of most diseases and disorders. Why? Because most disease begins in the gut. The gut has the highest concentration of immune cells, and the most common thing that the immune cells will react to is food. When you are constantly in pain, moody, and fatigued, your body is inflamed. In other words, your immune cells are being irritated by something in your environment. What is the most likely suspect that is irritating you? Surprisingly, it’s your food. Food has the power to heal, and the power to harm. Over a typical lifetime, the average person will consume 25 tons of foreign matter through their mouths. This food will pass down their “inner tube of life” otherwise known as the gastrointestinal tract. The cells that line this tube are specifically designed to keep out potentially dangerous food particles and bacteria. Just in case this barrier fails, our body puts over 70% of our entire immune cells directly on the other side of the barrier to neutralize any harmful food proteins or bacteria that make it through. But this system is rarely without its problems. Stress, toxins, bacterial overgrowth, medications, and even the foods themselves can easily damage the cells of the intestinal wall allowing for food particles to come in contact with the multitude of immune cells that reside there. The result is inflammation. Odds are that foods you are eating every day are leaving you sick and tired. How do you find out which ones? The Elimination Diet. This foundational tool of Functional Medicine has been used for centuries to discover which foods are making you ill and which ones can make you feel incredible. The Elimination Diet is a simple process of removing all potentially problematic foods from your diet until your symptoms subside—usually a few weeks. Then you slowly reintroduce foods back into your diet, one by one, to see which ones bring your symptoms back. By finding the foods that are behind your suffering, you can completely turn your health around and elevate your quality of life. Our Elimination Diet begins with a detox phase to calm the gut and the immune system. This phase consists only of fresh vegetable juices, green smoothies, and pureed vegetable and bone broth soups. Then we move into the elimination phase where you will be consuming an anti-inflammatory diet of foods that normally don't cause an immune reaction in most people. The last phase is the reintroduction phase where you will be challenging foods, one-by-one, for about 2 months beginning with the least reactive foods and ending with the most reactive foods like gluten and dairy. 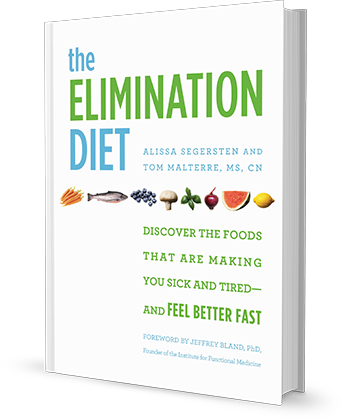 Order The Elimination Diet Book. The entire process of our elimination diet is outlined clearly and concisely in our new book. Plus, the book contains over 125 delicious, healing recipes! Join our Online Support Program. We've put together an amazing resource for you to have total success during your elimination diet. Get access to cooking instruction videos, webinar support with Tom, additional recipes, daily audio MP3 support, and much more! Next LIVE group program begins July 8th, 2017! Get started in your kitchen today! Sign up to get access to four FREE elimination diet cooking videos! You'll learn some very tasty (and easy) recipes that can begin the healing process. I joined the online support program, but I can't seem to find any menu plans or the Yes and No Food Lists. Is this coming at a later date? or am I missing something? I was hoping to give the list to my parents as they will be watching my kids at times during the diet and will need to know what we are eating. Thanks! I bought your book and it says on page 133 "You can visit our website -WholeLifeNutriton.net- to download free PDFs of these food lists." Could you please direct me the food lists? I don't want to pay $197 for the support program to download something that is "free". Any suggestions for getting started with a small child? I have some reservations with just feeding a child bone broth and green juice. We outline the variation for children both in the book and in the online program.....there are a few tweaks to the basic elimination diet to make it less restrictive but still effective, but the detox phase is definitely not for young children. Hello i have preordered the book and received the bonuses..thank you but where can I locate the elimination diet grocery list?? If you pre-ordered and received your bonuses then you also should have received our grocery shopping guide PDF a few days later (as well as the Journal). Just shoot us an email through the contact form here on the site if you did not get it. Hi - can this be done if you are vegan? Can you skip or substitute the bone broth? Are there animal-derived items that are non-negotiable? You can do the basic version of the elimination diet we have outlined in the book and online program as a vegan, however, your diet might get too limited (and you might not get what your body needs to heal) if you try some of the variations we have outlined for certain health conditions. Hope that helps! Good Afternoon, I heard your talk on Underground Wellness. My 3.5yr old son is considered failure to thrive and has been for his his entire life. He is only 25lbs and 36in. I believe he has digestive issues but I have not been able to get his pediatrician to listen to me. She told me flat out that children don't have digestive issues unless they have an underlying condition like CF which he does not have. His stool is very soft and wet with pieces of undigested food. He has 2 - 3 large bowl movements a day. When I ask him how he feels he always tells me he feel great, even when he is sick. I'm wondering how I can use the elimination diet to help my son when he doesn't know how to express how the food is making him feel. What we usually recommend is that parents do the elimination diet right alongside their children. This way you'll be more intimately connected with what he might be going through. You can watch for signs of bowel improvements during the first part of the diet. And then during the reintroduction phase you can keep an eye out for changes in bowel patterns, skin, mood, and eating behaviors. I only ask because I am in a similar situation. My daughter is 2.5 and very slow to gain weight. I think I finally found a good practitioner for supplements, but the diet is still a struggle. I'm quite shocked about the lack of help in this area. The Underground Wellness interview is how I learned about this too, and am considering it for my family. My heart goes out to you! I know how stressful this can be. Can this diet improve osteoarthritis? RE: Osteoarthritis improvement on Elimination Diet? I have seen this time and time again. Once of the best treatments I have seen. I'm one of those few people (or so it seems) that DO NOT need to lose weight during the elimination diet. Is there a way you might address providing some help for those of us requiring to keep our calorie intakes up. I already eat a reasonably clean diet, exercise and sometimes struggle to keep the pounds on. Thanks! Hi Lynn- Yes, Tom addresses this in the book and in our online program. There are a few modifications to put weight on (or maintain the weight you have). One being that you skip the 2-day detox. We have a number of people in our online group right now who have the same issue as you. HI, I'm thin and don't need to lose any weight I just read in the above comment this is covered in the book? Also, I have blood sugar issues that I struggle with. I have to eat constantly as it is so eliminating even more foods is frightening! I had hypoglycemia the first time I did the diet. I learned quickly that I had to bring lots of food around with me at all times. Now every time I do the 2-Detox, I carry around coconut oil and cooked squash all the time. I'll sip on soup most of the day and make sure my smoothies are spiked with amino acid complex, glutamine, chia seeds, and hemp seeds. Once you are on the Elimination Phase, you can cook up batches of dosas, chicken (roasted, shredded, as nuggest), turkey (in meatballs, turkey hash, soups), salmon (fillet, burger, jerky). Its totally doable and delicious! My goal, along with eliminating problematic foods, is to get the insulin down (which means, of course, that I must get the sugar down) as that may help with the other problems -except the COPD. I'm playing with decreasing the fruit and increasing the veggies - beets, cucumber, celery, leafy greens, an avocado and half an apple. Plus virgin coconut oil. This makes a little over 2 litres. Is this okay to keep around all day? I drink some about noon and some later on in the day, usually finishing it within 6 hours. Re: How long to smoothies keep? Driking the whole batch in 6 hours is great for the freshness. You may want to add in some Amino Acid Complex. It will increase satiety and flavor while increasing mitochondrial function. I have had some amazing case with COPD getting a ton better on our supplement Energy Support Package. What are the recommended serving sizes of the smoothies, juices, soups? Can I start without broccoli sprouts? Also, can they be purchased at the grocery store or do you have to grow them? Thank you. I am sure I will have more questions as I go along. Drink as much as you would like...usually between 2 and 4 cups, or whenever you feel full. You can sometimes find broccoli sprouts at your local health food store and yes you could use those. Lost weight, felt great for 2 months on Paleo. Now no energy. My husband and I have been on the Paleo diet for 18 months. We were feeling energetic and losing weight for the first two months. Then everything changed. We have no energy, gained the weight back, can't concentrate, whole body muscle aches, still dealing with chronic constipation, can't stay asleep, and other issues. How is this diet different? We want to get to the cause and finally fix us. Hi Roxie- this is not a paleo diet. It is similar in that it focuses on whole foods, but we include some gluten-free grains, and some legumes for the basic elimination diet (though for certain variations you will eliminate these too). We also remove foods that the paleo diet includes (like eggs, nuts, nightshades, etc.) that can be irritants. Figuring out how to heal ourselves is definitely unique and can take some patience and time! I do not have a juicer and do not want to buy one. Am I safe to assume that I can just do all soups for the two days of detox? You can use a blender to make smoothies, as well as rely on soups. You do not need to have a juicer. Hi, I bought the audio book from audiobooks.com, but I don't know how to access the PDFs for the recipes. I don't want to have to buy the paper book to get access to these. Can you help? I am currently reading your book. I am wondering about the supplements. I see a lot of suggestions, but I wonder are they just suggestions or necessary. Funds are not readily available for me and just buying organic is going to put a strain on my food money for the family. I NEED to do this diet. So many health issues. Is there a PDF for doing this inexpensive! Are supplements necessary for the Elimination Diet Program? Supplements are used to "supplement" a diet. While they help many people, they are not necessary. Some people who have had a history of digestive and intestinal issues may be nutrient deficient. They may not find the progress they need with dietary changes alone. With that said, the vast majority of people benefit from doing the diet with or without supplements so jump right in! Our Elimination Diet Program offers many tips on how to use foods to meet certain nutrient needs and prepare low cost versions of recipes. At this time we do not have an additional PDF with the resources you are requesting. I will be wishing you the best of success on your journey! Maybe just shoot me an email? Maybe just shoot me an email? I have been suffering so long. I need this elimination diet and I cant seem to find the funds. I have had horrible pain since childhood. Now as an older person, diagnosed as fibromyalgia. Not so I Have had joint/muscle pain since I could remember. Sometimes debilitating. It has to be the food. Blood tested for everything national and international. All neg, even arthritis when clearly visibly there is a problem. I just want to fell better. Please, is there a way to do this without being a blue or white collar person? Please email me back. Im so tired of hurting. I can see you are ready for change. A great first step to keep things easy would be to do a gluten-free, dairy-free, soy-free, and refined sugar-free diet. You can find great FREE recipes on our nourishingmeals.com website that will meet these needs. Once you have tried this out for 2-4 weeks, you may find that your increased energy and decrease in pain will motivate you to do more. Hello, Are there any recipes that I shouldn't use while nursing? I want to keep my milk supply. I heard that eating a bunch of parsley will reduce the supply. Also, I thought I had Candida, but after reading portions of your book, I'm thinking it may be due to irritant foods. Currently I'm pumping and dumping the milk because I'm taking some supplements for Candida and don't know if the die off toxins will get in the milk..... If it really is candida.... I'm not sure it is. Would you recommend going off the supplements while doing the elimination diet? If so, how long should I be off the supplements until I can start your program with no other factors involved, other than my body? Also, would you recommend pumping and dumping during your elimination diet as well? I HATE COCONUT!! I have ever since my 1st birthday. lol You should see the pictures. Seems like every recipe has coconut of some sort, and taking those recipes away, leaves not very much to work with. Is there a substitute for all of the coconut items? It is the only thing that I just won't eat, can't even stand the smell! did elim diet before... not clear results... blood type? I am considering your Elim Diet system. I have serious Mult Chem Sensitivity and leaky gut and food sensitivities. I've done various elim diets before and have been tested to be gluten sensitive (I am gluten free). Ten years ago, antigen skin pricks were positive to corn, soy, and but not dairy, yeast or egg but I realize I can gain new allergies. I know sugar is toxic to me. Question: I am always hungry on elim diets even when well balanced and enough calories and I want cheese even 4 weeks dairy free... then feel sated when I have cheese. Does this mean dairy is my "bad thing?" I'd hope not to miss it after so long. Second question: at the urging of a well respected naturopath, I skimmed the "Diet for your Bloodtype" list for AB. I was shocked to see some things I eat frequently, thinking them to be safe/healthy: coconut, mango, avocado, apple cider vinegar, chicken, venison. I also see things on their okay list that I know I am allergic too. It's therefore hard for me to consider this research as valid yet many people rave about the diet. Do you also see that people are simply too individual to use ANY diet as a baseline, including blood type? Would sugar and salt free sunflower seed butter from the company once again be ok? It says raw sunflower seeds but doesn't mention sunflower oil or butter. Hi - I was referred by an Air Force Dr who treated me for a severe fungal infection on my hand/wrist, with a secondary bacterial infection. This is the second serious fungal infection I've had in 3 months. I'm not diabetic and am otherwise "healthy" in the common, medical vernacular. Obviously I'm not too healthy if I continue to suffer from these skin problems. My question is: do I have to wait until I've finished the 10 day course of antibiotics he prescribed before I begin the diet? I'd really like to begin immediately, but see that this may be counterproductive under the circumstances. Glutamine does is play an essential role in cell volumizing, protein metabolism, increased production and secretion of Human Growth Hormone and anti-catabolism i.e. the injury and go down of muscle tissue, particularly in bodybuilders. After a passionate workout Glutamine levels reduces by as much as 50% in body. It is also been researched that Glutamine supplementation efficiently decrease muscle tissue breakdown and improves protein metabolism. Im eating Low FODMAP, Organic, phase 1-2 recipes only, cut out all grains/beans, consume broccoli sprouts and sauerkraut daily, and im taking the following supplements: Thorne Meriva, Digestive enzymes (high lipase), high quality probiotics, vitamin D, L-glutamine, milk thistle. AND my diarrhea is actually getting worse! please help! And today i just begun trying Betaine HCL challenge. I am about to start phase 1 of the elimination diet tomorrow. Can I consume bottled kombucha? Is it possible to follow elimination diet as a vegetarian? The base of my calorie intake are grains (mainly basmati rice), and a lot of fruit and starches. I have bought your book. It suggests (during phase 2) that I should visit your website to print out (and put on refrigerator) the lists of No and Yes foods, However, I cannot find these on the site, let alone print them. Please advise. Hi, I've heard of all the benefits of kefir but wondering if it's allowed in the elimination diet as it isn't on any list. In your Resources Tips you refer to ordering a Elimination Diet Support Package on your site. I cannot find this package anywhere on what I have seen on the site. Do you have a general search area on your site? Would help a lot to find things. Have your book and want to start the elimination program, in fact, made myself one of your green smoothies this morning. Oh, another question, how to I get from one of the free videos to the other? I'm afraid I have signed up more than one time in order to try to get to the next video. Thought I could just tab over or at least that I would see the "hand" on the next video, but that didn't happen. Am not totally computer literate but use many programs but that isn't helping me get around to things I would like to view. Sometimes I just "happen" on them accidentally while surfing your site but would like to get there in a more efficient manner. Help! I am going on vacation and thought 30 days would be enough time to complete Phase III. To date the elimination diet is going swell. A few challenges on days 1-3 due to caffeine withdrawal. Should I begin Phase 3 by reintroducing foods that I believe might be a problem? I would really like to drink coffee and wine while I am in Italy and will not have enough time to test each food group before hand. Any suggestions would be greatly appreciated.